FAYETTEVILLE, Ark. 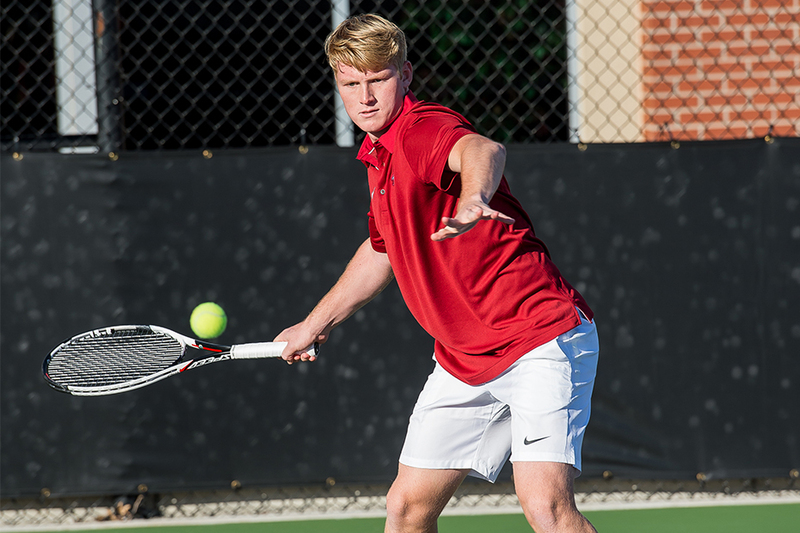 – The Arkansas men’s tennis team opened its three-match road swing with a 5-2 loss Wednesday night against the Central Florida Knights at the USTA National Campus in Orlando, Florida. The night did not get off to a good start for Arkansas, as the Razorbacks fell behind early, dropping the doubles point. Adam Sanjurjo and Oscar Mesquida fell to No. 7 Korey Lovett and Eero Vasa 6-3, while Jose Salazar and Alex Reco lost to Alan Rubio and Enrique Paya 6-4 to give UCF the early advantage. Brothers Jose and Pedro Alonso led Danny Kerznerman and Gabriel DeCamps 5-4 at the clinch. To start singles, Salazar was able to get Arkansas on the board and tie the match at 1-1, as the senior defeated Lovett 6-3, 6-2. The Razorbacks and Knights would split the next two courts, as Sanjurjo fell to DeCamps 6-4, 6-2, while Razorback freshman Josh Howard-Tripp defeated Mikhail Sokolovskiy 6-3, 6-3 to even things at 2-2. UCF would go on to take the next three courts and cruise to a 5-2 win. Reco fell to Vasa 6-4, 7-6 (7-5), while Mesquida lose to Rubio in three sets, 4-6, 6-3, 7-5 to clinch the match for the Knights. After the clinch, Alonso fell to Kerznerman 7-5, 3-6, 6-3.